Luke: …Is the Dark Side stronger? But now the Dark Side beckons. My interest in Cialdini stems from my curiosity of behavioral psychology as it applies to behavioral economics (and, in turn, how that applies to behavioral finance). More pointedly, it was my fascination with (first) game theory and (ultimately) decision-making that led me back to behavioral studies. I figured if I could better understand how other people make decisions, I could make better decisions for myself, my family and my clients. To date, this theory seems to have worked well. 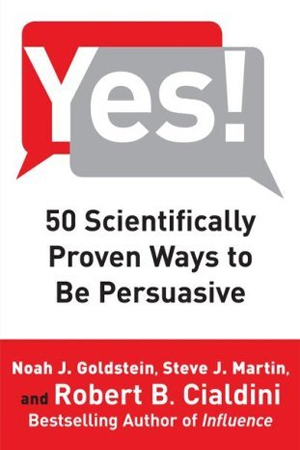 I earlier called Robert Cialdini “the Charles Atlas of persuasion.” With Yes! 50 Scientifically Proven Ways to Be Persuasive, Cialdini might now be called the Darth Vader of persuasion. (But maybe not, since Noah J. Goldstein and Steve J. Martin are listed as co-authors.) This new (2008) book delivers exactly what the title promises. In fact, it does so with nearly antiseptic precision. While the relatively quick read does not have the bibliographical citations of Cialdini’s earlier works, (it’s purely business, not academic), it does offer passing references to his principles. But the tone of this book differs drastically from the first two. Whereas in the original books, Cialdini exposes mental short-cuts you should avoid, in Yes! 50 Scientifically Proven Ways to Be Persuasive he shows how to use those very same short-cuts to your (possibly unfair) advantage. Now, don’t get me wrong. Some of these techniques don’t have an ethical burden. In Tactic #46 “Are Trimeth Labs Boosting Your Influence?” Cialdini reveals the power of caffeine. It turns out you’re more persuasive if both you and your audience drink coffee (or similar caffeine-laden beverages). There’s a caveat, of course – you still need sound reasoning. Caffeine, while making folks more agreeable to good arguments, has no impact on the agreeability of bad arguments. But not all examples are this pure. In Tactic #1 “How Can Inconveniencing Your Audience Increase Your Persuasiveness?” Cialdini and friends show how subtle changes in copy can induce the power of “Social Proof” (one of the six principles of persuasion outlined in Influence: The Psychology of Persuasion). That first book tells you how to dodge this trick. Yes! 50 Scientifically Proven Ways to Be Persuasive recommends you employ this trick. They must have really good cookies on the Dark Side. With apologies to Monty Python, the “wink, wink, nod, nod, say no more” almost jumps out at me upon reading the conclusion of this statement. Do you have the discipline to do that?